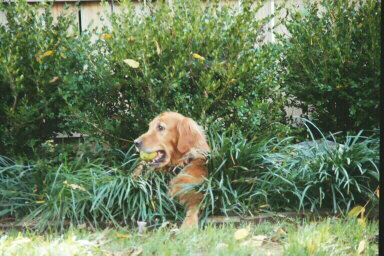 Sam's AKC name is Lady Samantha Golden Love. 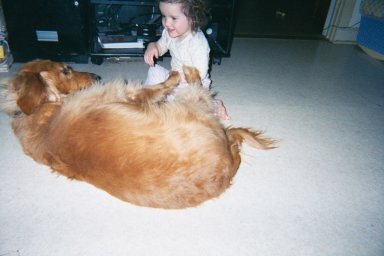 Sam was only one year old here. She is seven now. Her parents were both champions in agility and field competition. She is very smart and can do a lot of tricks. When she was only 5 months old, she was sent to a training school for two weeks. After returning home, she knew several commands and could heel well. Sam is always on a diet. Golden Retrievers tend to gain weight and so her Vet suggested that she stay on a diet of Fit and Trim and get a lot of exercise. For the most part, this works. But in the winter she tends to gain five pounds or so. When she can get out more, in the spring, she loses it. "Theres's always Room For One More"
Clean, but hungry, to our dismay. I stroked her head, her body rippled. One ear's lopsided, the other's been torn. He's coming in now, so I'll open the door, There's always room for one more. Sam's zodiac sign is CANCER. Cancer is the home sign of the zodiac. Cancer dogs love their homes and family more than anything. They would just love to sit in their homes and never leave. Just try to get them out of the house for a walk. Travelers they aren't! If you're looking for a pet for children, you've come across the right sign. Cancer dogs love children and babies. In fact, they will mother anything or anyone they can. Get them lots of toys, they love to play and they love to cuddle. They will cuddle pillows, comforters and especially you!! If you like independent animals, you better get an aquarius or a gemini. These guys wont let you go into another room without following you. "Velcro pet" comes to mind. They love to eat, especially treats. If you give them too much, they will become round and fat. They are collectors. If you have to throw out any of their toys, don't let them see you. 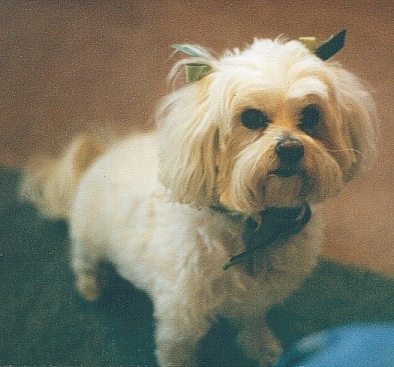 We, at the Aleksander House love pets and dedicate this entire page to them. I would like to introduce our mascot, Lady Samantha Golden Love. 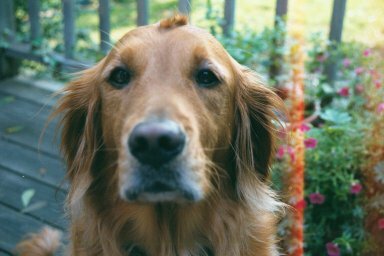 She is the sweetest, most gentle and loving Golden Retriever you'ld ever want to meet!! If ever you have occasion to visit the Aleksander House, Samantha will greet you with a wagging tail and wide grin. She loves people. In fact, she loves everything and every body. She's a very happy dog. If you bring your dog with you (which we hope you will), Sam will be more than happy to take her or him for a friendly sniff around the back yard. She's very fond of other dogs, cats and children. Here she is playing with my granddaughter, Kira. Kira calls Sam "Mantha". She pulls Sam's tail, jumps on her back and chases her all over. Sam doesn't seem to mind. She just licks Kira in the face. They are so cute together!!! Grown-up Lady Samantha was 7 years old in July, 2002. Sam has a cowlick on her head. It is very cute!! It's one of the reasons I picked her out of a litter of ten puppies! Sam has a lot of doggie friends in and around the neighborhood. Some of them live in bed and breakfasts, like she does. She also has a lot of doggie visitors who come to stay in our bed and breakfast.I take pictures of them or they are sent to us by loving pet owners. Sam wanted me to put some of the pictures on her page, so here they are. This is Cindy. Cindy lives just a few blocks from us in a huge mansion which has been converted into a bed and breakfast. She is referred to as The Samuel Culbertson Mansion House Princess and has the following duties to perform: To be cute, lovable and entertaining and will disappear when required. She also dusts the baseboards without being told and discourages possums from bothering the house-finches in the garden. She is a Pomeranian (Blueblood) X Teddy Bear, born Cinderella Dawn in April of 1994. She loves beer, scotch & soda. Her favorite foods are: corn on the cob and Westphalian ham. She has her own web page, like Sam. This is Cher. Cher lives in a beautiful, yellow Gothic mansion bed and breakfast. Although she greets all the guests when they arrive, she's getting a little on in years and has slowed down a bit. Sam has visited Cher's home, but Cher has never been to hers. Cher is a cheerful, gentle little puffball who likes strangers and other animals. Like most Bichon Frises, she is active, alert, curious and highly trainable. 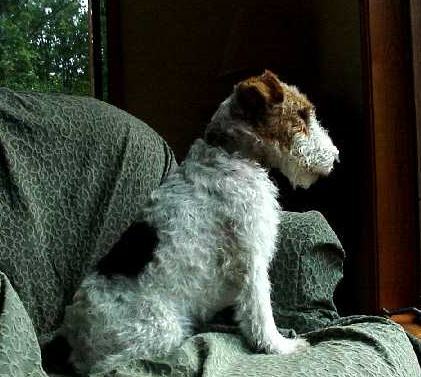 This little wire-haired Fox Terrier visited us during a dog show held at the Kentucky Fair Grounds. We can't remember is name, but we do remember that he was entered in a couple of competitions and came out with a blue ribbon. He was adorable! the Li-ri-o-pe *(see picture above). and buries her furry nose. and grabs it with her toes. and tosses it up high. and catches it on the fly. She's such a clever acrobat. She's smart, she's cute, she's funny. for any amount of money! !